A friend has asked for craft project suggestions for her 13 yr. old daughter's sleep over party. I think it might be fun to make some rings and charms. This great tutorial at PlanetJune for fun and simple Shrink Plastic Rings is great inspiration. If you decide to do this, there are some good tips in the comments and it would probably be a good idea to check with the other mothers about working with hot materials. Then there is this tutorial by Meander on the ThreadBanger Forum about glazing shrink plastic charms with clear embossing powder. It's a nice soft finishing touch. From Ruby's Jewelry Design and Beadwork is this simple beaded ring tutorial. Ruby has quite a large collection of beadwork tutorials here. This printable ring sizer from AtlantisRing.com would be helpful. You would want to have the correct size mandrels (dowels, pens etc.) 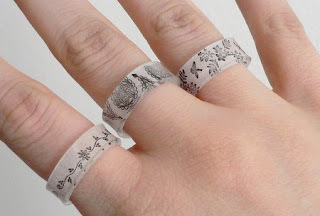 for each girl to wrap her shrink plastic ring to the correct size. The British Museum allows free non-commercial use of their images. This is a huge data base that will take me many trips to explore. I like this one and may use it as a Spoonflower project. I want a screen in front of the television. This just may fit the bill or as a nice piece over the couch in my craft room. When you find an image in the database that you want to use, click the button above it that says "Use digital image". Sign up and you will receive a high resolution version via e-mail. I've copied the terms and conditions below. Use: In non-commercial publications with a print run of no more than 4,000. Please read the terms and conditions. Size/quality: Jpeg, with the longest edge at 2,500 pixels, which will appear at a maximum of 21 cm (A5) when printed at 300 dpi. The image may not have been colour-managed or cleaned. Delivery: Register with your name, address and email address. We will email the file as an attachment. You may order up to 100 images per month, subject to the terms and conditions. Danny Seo's eco-friendly and crafty ideas for everyday living. 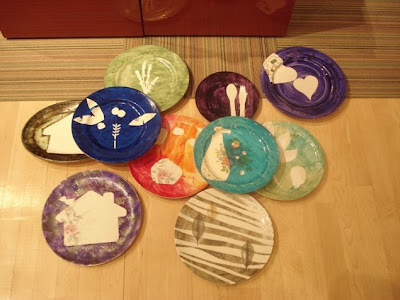 Here is a picture of Danny's own reglazed plates in his craft room. Amy's girls are among the luckiest in the world. 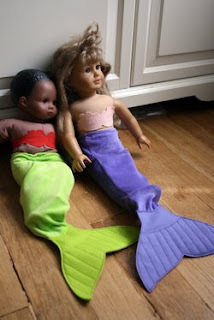 Their mother made removable mermaid tails for the dolls. Too cute. Visit Angry Chicken where she shares a tutorial for these lovely mermaid costumes. 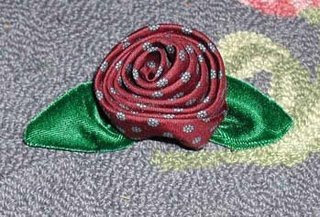 Barb (aka woof nanny) has started a new blog about sewing with neckties. She says "I have too much interest, and too many links about neckties... and that my love of sewing with neckties deserves its own blog." Visit Artful Ties. Barb would like to host a swap so if you are interested, be sure to let her know. 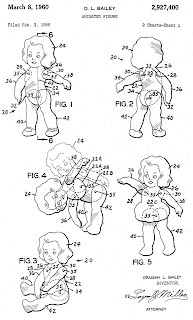 Click the pictures, download from Google Patents. Love the dog in this one. Sweet Junie Moon created a downloadable booklet of natural cleaning recipes for me and we are sharing this lovely booklet as our commemoration for Earth Day. She generously calls it a collaboration but the recipes are the ones she uses and she did all the work. Since I've started having neurological problems I've become more sensitive to chemicals. I saw that June had made her own cleaning supplies. More than that, she made the containers beautiful! I wanted the recipes and also thought that a booklet and a page of labels along with ingredients and bottles would make a nice gift. I'm so thrilled that she took the time to put together this booklet and hope that you will like it too. 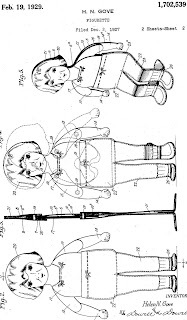 Visit Junie Moon and download your own. Patricia has shared this lovely paper model along with a windmill. It just makes me smile. Clicking the pictures on her blog, Agence Eureka, will take you to her Flickr papercraft set where you will be able to get full size printables. My friend, chronicler, makes the most beautiful cakes and has shared the recipe with a tutorial for this lucious looking buttercream that she says her customers think is fondant. I have never made a decent looking cake and now I know why. 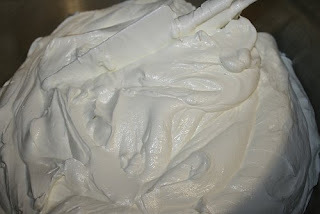 She calls the recipe Basic Buttercream; I call it the Ultimate because I've never seen this technique. 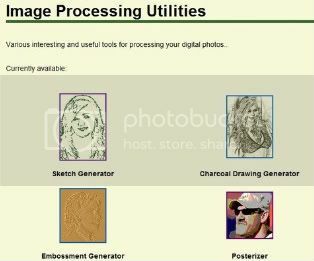 Online image tools by Sporkforge. I had fun with Sketch and Posterizer. The True Up blog is all fabric news, all the time. True Up is written by Kim Kight, fabric aficionado. She is an avid fabric collector with a particular interest in midcentury prints. She is also an eager freshman in the self-taught school of surface pattern design. She has been writing about her crafting projects online at Dioramarama since 2004. Gifts from marie claire idees. The eight pdf patterns will print on A4 paper and the you enlarge by the percentage noted with each pattern. The Library of Congress has long been my favorite site. They are now sharing some of their holdings on Flickr. There is a FAQ page explaining that you may use the photos and where to get higher resolution versions. Geeze, I love the internet! Somehow I'm able to find just the right tools to accomplish the task at hand. I needed a way to turn the Matrimonial Primer into a booklet and found this tool. 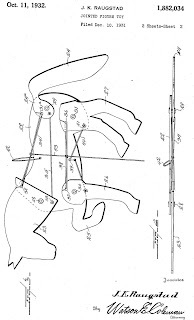 The instruction page is very clear and offers printing instructions. I ran the BookletCreator with an uncleaned copy of the pdf download of The Matrimonial Primer. It worked beautifully! I am still undecided about using the color or black and white copy. The b&w copy did not have the beautiful end papers showing and the lovely sepia fill color is a dead grey. 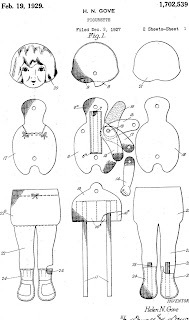 Instructions with pictures from Creative Needle Magazine. Ever creative Vicki is sewing covers for her ugly office chairs. 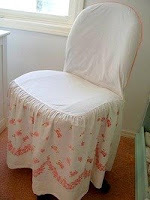 Visit her blog, turkey feathers, to see how she made such a lovely transformation. This little book would make a good gift for each place at a reception. It's illustrated, has funny and true advice for men and women and would be a good conversation starter for strangers seated at the same table. The Matrimonial Primer is available at the Internet Archive and is downloadable as .pdfs. I think using the black and white version would make it easier to clean up the pages and then print it on some rich, creamy paper. Binding method depends on budget. I'm almost done posting about the "home made wedding project". I'm just crazy for Mark Jenkins' tape sculptures and think that the concept would make great outdoor lighting for parties. 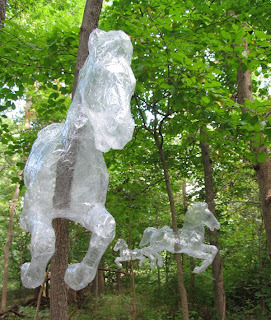 Tape sculpture is made by wrapping an object with plastic wrap and then adding layers of clear packing tape for strength. Cut the taped shape off the object, repair the cut with more tape and you have a sculpture. I'm thinking stick up lights as the light source. I want house shapes and trees for the outer edges of a yard party. The house shapes could be made from large cardboard boxes and pointy trees from upside down tomato cages. Here is Mark's tutorial for making a tape sculpture. This is the best site I've found for box templates. Idee Montabili offers 32 free vector (.eps) templates of boxes. 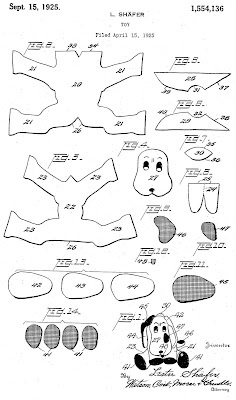 There are also templates for clothing and other products. This USED TO BE a great site. The free offerings are far fewer now, a lesson in "snag it while you can. Picmarkr is a free web based watermarking service.